We’d love your help. 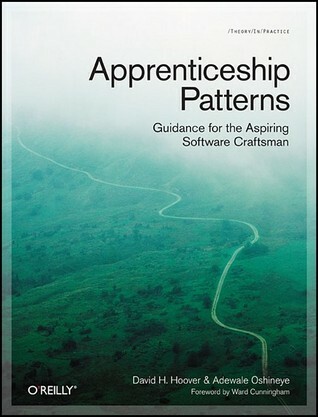 Let us know what’s wrong with this preview of Apprenticeship Patterns by Dave Hoover. Are you doing all you can to further your career as a software developer? With today's rapidly changing and ever-expanding technologies, being successful requires more than technical expertise. To grow professionally, you also need soft skills and effective learning techniques. Honing those skills is what this book is all about. Authors Dave Hoover and Adewale Oshineye hav Are you doing all you can to further your career as a software developer? With today's rapidly changing and ever-expanding technologies, being successful requires more than technical expertise. To grow professionally, you also need soft skills and effective learning techniques. Honing those skills is what this book is all about. Authors Dave Hoover and Adewale Oshineye have cataloged dozens of behavior patterns to help you perfect essential aspects of your craft. To ask other readers questions about Apprenticeship Patterns, please sign up. 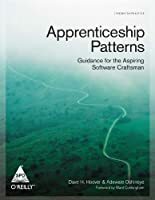 Think of Apprenticeship Patterns as a bugfixing patch for Pete McBreen's "Software Craftsmanship"
While reading McBreen's book, it becomes clear after a while that what he is describing is an ideal, something of a "this is the way that the software industry ought to work" and while reading it I couldn't help but agree, it ought to. However, the real world is so vastly different from McBreen's utopia that it often feels hopeless, like a lot of the great benefits of the book are out of reach becaus Think of Apprenticeship Patterns as a bugfixing patch for Pete McBreen's "Software Craftsmanship"
While reading McBreen's book, it becomes clear after a while that what he is describing is an ideal, something of a "this is the way that the software industry ought to work" and while reading it I couldn't help but agree, it ought to. However, the real world is so vastly different from McBreen's utopia that it often feels hopeless, like a lot of the great benefits of the book are out of reach because of constraints of the real world. Apprenticeship Patterns aims to fix this, by showing how apprentice software craftsmen can benefit from the ideas even in the real world. It accomplishes this goal very well, grounded in pragmatism but relentlessly adamant about how software professionals can live. The book is organized like a Design Patterns book, with individual named patterns and a formula to each section. This feels somewhat like a square peg in a round hole, but the strange format doesn't distract from the book's content, which is excellent. Though there are a lot of common sense patterns and a number of "I've seen this before" patterns, the book has a lot of new stuff, a lot of great suggestions, and is overall a well-organized wealth of advice for programmers who take themselves, perhaps, a bit too seriously. I highlighted a LOT of stuff. Вдъхновяваща книга, която трябва да ви изпълни с ентусиазъм за промяна и развитие. Успях да извлека няколко поуки, които ще опитам да приложа в практиката си, но ще почакам малко и ще им направя повторно ревю. Книгата ми казва, че технологиите, с които се занимавам са стари и за да стана по-добър трябва да зарежа старите знания и да уча нови. Книгата ми казва, че трябва да се заоградя с по-добри от мен програмисти и да ги напъвам да ми споделят знания. ОК. Точно така работят нещата при 2 категори Вдъхновяваща книга, която трябва да ви изпълни с ентусиазъм за промяна и развитие. Успях да извлека няколко поуки, които ще опитам да приложа в практиката си, но ще почакам малко и ще им направя повторно ревю. Phenomenon of golden lock "I'd like to learn something new, but what I already know pays too well"
Humility is one of the foundations of a successful apprenticeship. Combined with ambition, humility will help keep you focused and progressing in the right direction. The core theme of an apprenticeship is learning and the dominant trait of a successful apprentice is a demonstration of her learning abilities. Learning is a perpetual activity for those on The Long Road to mastery. as the act of repeated practice. Your notebook, blog, or wiki should be a nursery, not a graveyard—lessons should be born from this record, rather than going there to die. Very useful for learners. And, trainers also. it also contains many interesting and very useful ideas that we could apply in our work to help our skills grow and our career flourish. As one of other readers wrote "Best development book I've read, has no code in it"
The greatest messages that stuck out to me was, as you are starting your journey as a software developer, reading the right book at the right time significantly impacts your personal development. This was definitely the best time to read it, which in turn provides me a list of great books to be read. An absolute must read for anyone aspiring to be an excellent software craftsman, also for anyone managing developers or technical employees it's a good read so you can spot who's making the right moves and who is taking the long path to excel and not just sitting around and doing their job. I recognised almost all the patterns in myself having done this for a long time. As it usually happens in real, I only came across this amazing book several years from when I most needed it in my professional career. By the time someone referred me to it in 2014, I had already begun my long journey to become an apprentice and aspiring journeyman. I like to tell people that I learned things the hard way, getting my education from The School of Hard Knocks. To this day I still believe that the Sweep The Floor and Be The Worst patterns were designed with me in mind! Of course I As it usually happens in real, I only came across this amazing book several years from when I most needed it in my professional career. By the time someone referred me to it in 2014, I had already begun my long journey to become an apprentice and aspiring journeyman. I like to tell people that I learned things the hard way, getting my education from The School of Hard Knocks. To this day I still believe that the Sweep The Floor and Be The Worst patterns were designed with me in mind! Of course I didn't know that there were patterns to describe what my professional life going through, and maybe this was a good thing in the long. I think every developer should read this book. A handbook with a lot of good thoughts and best practices about our profession. Very inspiring. It sometimes describe an utopical world, but that's what you get when you have to push your optimism and your commitment to the limit. I think that also non-developers could benefit from a lot of the patterns described. Note: it's not a book just to read, you have to keep it on hand for when you need motivation. Interesting, but much of it seemed like common sense. They completely skipped over work/life balance, which if you followed all the patterns in the book, would have a strong chance of getting completely out of whack. Excellent book to make you think about the road ahead as an aspiring software craftsman. Must-read! Short book full of very "deep" insights like "read constantly", "seek more experienced and learn from them", etc. This review has been hidden because it contains spoilers. To view it, click here. Apprentices are people who are willing to take on a junior role that maximizes their learning opportunities, as opposed to people who try to climb as quickly as they can into roles that maximize their financial opportunities. In my experience, if the apprentice has talent and the right attitude, their financial success will inevitably follow their learning success. “I want to change the way people think about programming,” Kent said. I agreed. We both wanted to reverse what we thought h Apprentices are people who are willing to take on a junior role that maximizes their learning opportunities, as opposed to people who try to climb as quickly as they can into roles that maximize their financial opportunities. In my experience, if the apprentice has talent and the right attitude, their financial success will inevitably follow their learning success. “I want to change the way people think about programming,” Kent said. I agreed. We both wanted to reverse what we thought had been a wrong turn in the progress of our industry. And, amazingly, we did it. The strongest patterns are the ones that are applied productively over and over again. Patterns don’t have to be new to be useful. In fact, it’s better if they are not new. Well, we’ve overloaded our profession with resources. So, why this book now? Well, we’ve overloaded our profession with resources. There is more information available about our revolution than any one person can absorb. Still, some people manage to do it. They internalize all the advice available to them and always seem to have it close at hand. How do they do achieve that level of mastery? This book is full of patterns for mastering our complex field. Mastering is more than just knowing. It is knowing in a way that lightens your load. All the advice that has come out of our revolution does not help much until it becomes second nature. The craftsmanship movement in software recognizes that making this stuff second nature isn’t, well, second nature. These patterns are a welcome contribution to this progression. He who knows not and knows not that he knows not, is a fool — shun him! He who knows not and knows that he knows not, is unlearned — teach him! He who knows and knows not that he knows, is asleep — awaken him! He who knows and knows that he knows, is enlightened — follow him! A pattern is a named description of a recurring solution to a problem in a given context. Patterns are meant to be open to modification to fit your circumstances rather than mechanically applied. As with all pattern languages, you should be careful not to overuse these patterns. Don’t look for excuses to use every single pattern, but instead pick and choose the most appropriate set for your situation. book—you can dip into it for inspiration from time to time. 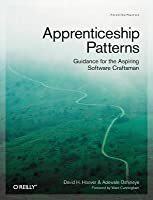 This book is written for software apprentices—for people who have had a taste of developing software and want to take it further, but need some guidance. There are many other books we would recommend for people in those roles, but this book is for people at the beginning of the journey. The journey discussed here starts with “Hello world!”, but where does it end? Far too often, it ends with a promotion to middle management. The journey discussed here starts with “Hello world!”, but where does it end? Far too often, it ends with a promotion to middle management. Too many talented people thoughtlessly take that promotion and find themselves just a few years later in jobs they don’t enjoy and yearning for retirement. But for those who have a knack for developing software and enjoy the learning process, software development is a career that can last a lifetime, and it can be a great ride. For any programmer proficient in his first language, it’s always a temptation to fall back to the standards and idioms of your native language when you’re learning a new language. Our goal here is not simply to hand people a rule book, but to give them the ability to create new practices for new contexts, which in turn drives the discipline of software development forward. An attachment to Carol Dweck’s research, which calls for a “growth mindset.” This entails a belief that you can be better and everything can be improved if you’re prepared to work at it. In her words, “effort is what makes you smart or talented” (Mindset, p. 16), and failure is merely an incentive to try a different approach next time. It is the opposite of the belief that we’re all born with a given amount of talent, and that failure is an indication that you don’t have enough of it. A need to always be adapting and changing based on the feedback you get from the world around you. A desire to be pragmatic rather than dogmatic. A belief that it is better to share what we know than to create scarcity by hoarding it. A willingness to experiment and be proven wrong. This means we try stuff. We fail. Then we use the lessons from that failure in the next experiment. A dedication to what psychologists call an internal locus of control. This involves taking control of and responsibility for our destinies rather than just waiting for someone else to give us the answers. Instead, we think that a useful system should be able to identify and absorb the best ideas from all elements of the software development community. you must learn to grow yourself, to learn how you learn. At some point, an apprentice is approached by a master or a journeyman and told that her work and her role in the community are that of a journeyman. In such a case, the apprentice had previously begun taking on more responsibilities, and like a “boiled frog” had made a gradual but not discrete transition from one state to another. That transition may take longer for some people than for others. For some, the transition may take longer than their professional careers. The journeyman’s responsibilities are wider than those of an apprentice. As such his failures can do more harm. Some of the patterns we will discuss are not appropriate for a journeyman, precisely because he has a greater responsibility to others who may see him as a mentor. They might be facing overbearing and/or incompetent managers, de-motivated coworkers, impossible deadlines, and work environments that treat novice developers like workhorses, storing them in small, rectangular stalls with a PC and a crippled Internet connection. An apprenticeship is a season in your career when your focus is more on your own growth than almost anything else. The more experience you already have, the more effort you will need to put into “emptying your cup,” clearing your mind of bad habits, setting aside the pride you have in your skills, and opening yourself up to the different, often counterintuitive, approaches of your more experienced colleagues. One of the fundamental ways to improve the experience of learning your first language is to have an actual problem to solve. One danger of digging deep into your first language is getting stuck. It likely will remain with you throughout your career as your native tongue. Apprentices comfortable with an object-oriented language should explore a functional programming language. Apprentices comfortable with dynamic typing should explore static typing. Apprentices comfortable with server-side programming should explore user interface design. never stopping to think that the freedom to be foolish might well be one of the keys to the genius’s success. Find an opportunity to unlearn something. Ideally, this would be something that forces you to put aside your previous experience. Ask that person to explain some of the misconceptions that people from your particular background usually have about their community. Despite (and because of!) your inexperience, you bring some unique attributes to your team, including an infectious enthusiasm. Do not allow anyone to dampen your excitement for the craft—it is a precious commodity and will accelerate your learning. They either repress their enthusiasm altogether, or allow it to manifest only outside of their day jobs. Comprehension can be increased if more levels of experience are connected, as when newcomers who take nothing for granted interrelate more often with old-timers who think they have seen it all. Craftsmen learn from the apprentices, even as the apprentices learn from them. Enthusiastic beginners not only renew the craftsmen, but also challenge the craftsmen by bringing in new ideas from the outside. A well chosen apprentice can make even a master craftsman more productive. Collect the CVs of people whose skills you respect. According to research by the social psychologist Carol Dweck, the need to appear competent is ingrained into people of most industrialized societies. Software craftsmen build their reputations through strong relationships with their clients and colleagues. Expertise is a by-product of the long road we’re all on, but it is not the destination. Over the course of their journey, craftsmen will work with countless technologies and domains. However, as an apprentice with aspirations to mastery, you need to be willing to Expose Your Ignorance as well. Remember that learning in public is one of the ways in which an apprentice begins the transition to journeyman. It’s a small step from learning where people can see you to teaching. One of the distinguishing facets of the craft approach is a willingness to put the wider interests of your community before your own, rather than using the team and the client to further your personal growth. This new knowledge you have may reveal gaps you hadn’t noticed before; don’t forget to add these things to your list. It’s your responsibility to offset the risks of this approach by Finding Mentors and Kindred Spirits who can provide help when you need it. Dave saw that although these exceptional people were miles ahead of him, they were all walking the same road. you should keep in mind the expectation that you will be a working software developer even when you are middle-aged. And rather than counting the days to retirement, the craftsman will willingly and joyfully work into her final decades. Imagine that 40 years from now you are asked to write a short description of your professional history and the biggest influences on your path. Use the output from that thought experiment to help you plan your future career choices. The things we build for customers can be beautiful, but must be useful. utility and beauty are not opposed, but interdependent. Sometimes you will make the wrong trade-off, and fixing that mistake by rewriting the system from scratch may not be in the customer’s best interest. In those situations you will need to develop the ability to refactor and repair. Anyone who has ever seen a programmer at work...knows that programming itself, if the programmer is given the chance to do it his way, is the biggest motivation in programming. Your mother might think you deserve it, but impressive titles and responsibilities do not indicate that your apprenticeship is over. more time with your family or more money, or perhaps a new vocation has captured your attention. If and when they came back, we welcomed them with open arms because those experiences had given them new perspectives they could share. Sadly, conventional software organizations may not be so welcoming. They often see these detours as suspicious gaps in your career that you must justify. They will expect you to have a rationale that makes sense within their value system for why you left and why you’re coming back. Organizational cultures that encourage software craftsmanship are rare. We would build on that idea and assert that the core theme of an apprenticeship is learning and the dominant trait of a successful apprentice is a demonstration of her learning abilities. The only people who achieve much are those who want knowledge so badly that they seek it while the conditions are still unfavourable. Apprentices are thirsty for opportunities to replace their ignorance with skill. A good way to ensure you have interesting exercises to use in your practice sessions is to trawl through old books like Programming Pearls, More Programming Pearls, or Etudes for Programmers. Over time, maintaining a wiki can teach you about HTTP, REST, parsing, web design, caching, full-text search, databases, and concurrency. Early in your apprenticeship, develop the habit of regularly sharing the lessons you have learned. This may take the form of maintaining a blog or running “brown bag” sessions amongst your Kindred Spirits. Failure is inevitable. It happens to everybody sooner or later. In fact, someone who has never failed at anything has either avoided pushing at the boundaries of their abilities or has learned to overlook their own mistakes. Be sure to intermingle classics with modern, pragmatic books and/or articles in your Reading List. This means that the next time someone talks to you about Representation State Transfer, better known as REST, you should take that as an excuse to read Roy Fielding’s PhD thesis in which he defined the concept. Armed with your deeper knowledge of HTTP, try to implement a client and a server for RFC 707. We can guarantee that the tools you use as an apprentice will be obsolete by the time you become a journeyman. In time, all of your favorite tools will become junk. For your career to prosper, you must learn to acquire and abandon familiar tools with ease. When we say that something is a craft, one of the things we mean is that it is a discipline and a tradition that places a high value on skill. This includes acquiring, growing, and eventually transmitting that skill. We believe true mastery is shown in the effect you have on others by transmitting your superior skill. In software development, we don’t know exactly what constitutes mastery, but we do know what it isn’t. As an apprentice, you should aim to become better than your teachers. And if they are good teachers, they should try to help you achieve that goal. Mere genius is not mastery, but if a person is able to train others to equal or surpass her genius, then it becomes evident that person is a potential master. Working with masters is the best way to learn a craft. I found this book amazing. Some of the ideas are not new, but all of them seem valuable. They apply to different points along a career path so I can't test them all out now, but it was awesome to see what I'm already doing right, what other strategies I could add to my learning endeavors, and what I can keep in the back of my mind for much further down the road. I believe this book could be helpful to anyone pursuing a craft skill - I think that's most skills that are not science or art. However, I found this book amazing. Some of the ideas are not new, but all of them seem valuable. They apply to different points along a career path so I can't test them all out now, but it was awesome to see what I'm already doing right, what other strategies I could add to my learning endeavors, and what I can keep in the back of my mind for much further down the road. I believe this book could be helpful to anyone pursuing a craft skill - I think that's most skills that are not science or art. However, it's got a lot of software references so it might take a little work on the part of the reader to filter out those specifics. Of course, anyone who is willing to do that is probably the right kind of person to get a lot of benefit from this book. It is a good book with patterns written like the Design Patterns book by Gang of Four. But it starts off very much opinionated about software engineering. The writers tried to pass of software engineering as something sacred. However, as you go further, the view changes and they offer patterns to all types of software engineers. Some are very common, but a few were insights from experienced people that are still applicable in this day & age. Additionally, the writing style is very easy to re It is a good book with patterns written like the Design Patterns book by Gang of Four. But it starts off very much opinionated about software engineering. The writers tried to pass of software engineering as something sacred. However, as you go further, the view changes and they offer patterns to all types of software engineers. Some are very common, but a few were insights from experienced people that are still applicable in this day & age. Additionally, the writing style is very easy to read. This book inspired me to write book reviews as a way of maintaining a "Reading List". It challenged me to start a website so that I can "Share What You Learn". Almost every chapter of the book has inspired or challenged me to do something. Some books you read and nod your head, this book you read and put into action. I've rated it 3 stars since I happened to read the book at this stage of my career. Had I read it when I started out, this would've definitely been a 4 star or more. That being said, I'd highly recommend this book for someone who is starting out as a programmer. For newcomers and experienced developers - both will benefit from this book. Lots of great advice on the craft of software development and the long road to becoming master software craftsman. A must read for very software developer in my opinion. Although, it occasionally feels a little dated. Very informative, understanding and pragmatic. I'll come back to this frequently as long as I'm learning (which hopefully is forever). Some common knowledge, feelings and methodology of a novice developer has been captured in a structured format. I already knew most of them, but now I know them as patterns. It has a bit of an undercurrent of servant and master, which I found a bit offputting, and I have to emphasize that I am not sending hidden messages when I ask people to read it. Otherwise very good. 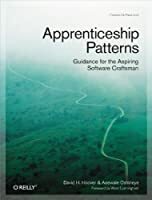 An impressive collection of apprenticeship patterns that any software engineer should be aware of. Really regret that I did not read this at the beginning of my programming career. Must read! A very insightful book. I recommend to anyone interested in becoming a good software developer.